Media Studies majors have something to say. 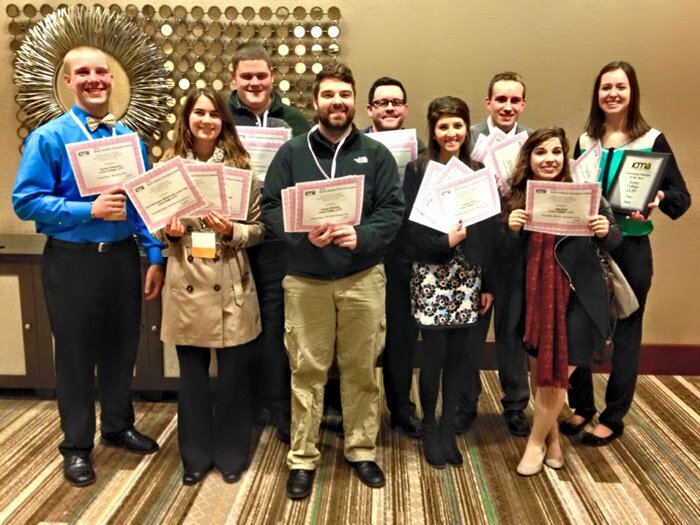 Whether it be through a film, documentary, newscast, commercial, live sports broadcast or animation, Loras Media Studies students seek to bring their creative, storytelling talents to the world. Quite literally. Our students consistently travel the globe creating films and reports everywhere from the Caribbean to Europe and Asia, winning more awards than any other college or university in Iowa by a large margin. You simply will not find another small college that offers more quality, breadth and depth of study in the media field. We prioritize our students’ opportunities to learn on day one and set the bar high, challenging you to push further than you’ve dreamed. If you have something to say, and want to perfect its delivery, the Media Studies program at Loras is the right choice for you. Learn more about the Loras Media Studies program, internship opportunities and preview some great work our students have done. 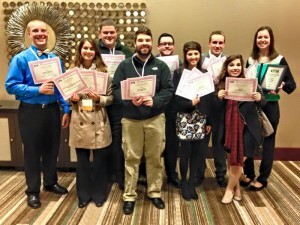 LCTV is the Iowa College Media Association’s “Station of the Year” for the 10th straight year! You will simply NOT find another small college that offers more quality, breadth and depth of study in the media field. We prioritize our students’ opportunities to learn BY DOING on day 1, NOT year 3 or 4. We set the bar high and challenge you to push further than you’ve dreamed and that’s why Loras students succeed. Covered Presidential inaugurations in Washington, D.C.
A minimum grade of C+ is required in L.COM-225 for all media studies majors. A minimum grade of C must be received in L.COM-131 and L.COM¬-485. A 2.25 cumulative grade point average is required in all other required courses submitted to the major and/or minor. If the minimum is not achieved, the student must retake the course. A minimum of a C is required in L.COM-131. A minimum grade of C+ is required in L.COM-225. A 2.25 cumulative grade point average is required in all other courses submitted for the minor. A studio performance course designed for the beginning actor, as an exploration, through both theory and practical application, of acting performance for the stage. Styles of acting approached within the class include improvisation, view pointing, method and commedia; with the major area of focus being improvisation. The course requires frequent stage performance. Some background in theatre performance is recommended. 3 credits. “Man’s (sic) best friend,” “It’s a dog’s life,” “Fighting like cats and dogs.” These are more than sayings and phrases linked to a popular domestic animal. They are cultural references to the many communicative characteristics of the canine. In addition to their long-time role of family pet, herder, and police support staff, dogs are increasingly used for disability assistance, prisoner rehabilitation and nursing home fellowship. This course will immerse students in selected communication theories. Specifically, the course examines communication concepts such as perception, emotions, interpersonal interaction, compliance gaining, verbal messages and nonverbal messages. The course will also expose students to professionals who train and utilize dogs for their many communicative abilities. Students will complete service work. 3 credits. January term. A wide-ranging survey of the history, functions, effects, social issues and ethical responsibilities of the media. Includes theory grounded in mass communication. A minimum grade of C is required for students majoring in media studies or public relations. 3 credits. A study of the basic techniques and methods of effective television broadcasting, programming, production, and studio operations. 3 credits. Intercollegiate participation as an attorney or witness in a simulated court trial or in a mediated settlement conference; stresses analytical and presentational skills. In part, the student will be evaluated by professors, attorneys, and judges. Prior legal knowledge not essential. Consent of instructor required prior to enrollment spring semester. 1 credit. An introduction to the theories and applications of communication in our daily lives. Various approaches exploring interpersonal, intercultural, organizational and mediated forms of communication will be studied. 3 credits. Hands-on experience through participation in a Loras Players production. Credit may be earned by participation in either the technical areas of the production or by participation as an actor. Contact the Director of the Loras Players. 1-3 credits. A basic course introducing the theories, processes and techniques involved in researching, planning and implementing programs designed to influence public opinion and behavior, particularly as based on communication theory. 3 credits. An exploration and experience in the various aspects of recreational and educational theater. Emphasizes basic technical production elements, including scene construction, costumes, lighting, painting, properties, etc. Requires classroom demonstration production exclusive of acting. 3 credits. Prerequisite: L.LIB-110. Emphasis on format, style, and writing techniques in radio, print, web and television. Practice in the development and scripting of news stories, commercials, and PSAs. For media studies majors or minors, the division requires a minimum grade of C+ in this course. Prerequisite: L.LIB-105 or L.ENG-111; Prerequisite or Corequisite: L.COM-131. 3 credits. This course will explore the theory, criticism, and production of experimental video. Students will become acquainted with the purpose and motivation of experimental video in relationship to narrative and documentary forms. Prerequisite: L.COM 158 or L.COM 164 or permission of instructor. 3 credits. An exploration of the history of live theatre as it developed throughout Western culture, with emphasis placed on the major historical periods from ancient Greek to the modern Realism/Antirealism movement. The course incorporates a variety of approaches including student presentations, historical research, and group activities. Requires lab time to view two live theatre performances. Prerequisites: L.LIB-100, L.LIB-105, L.LIB-110, and one course from L.LIB-130, L.LIB-135, or L.LIB-220. 3 credits. A general introduction to live American theatre with emphasis placed on audience appreciation and understanding of production practices. Through a variety of approaches such as student presentations, group activities, and theatre performance, the course considers and explores methods used by American theatre artists. Requires lab time to view two live theatre performances. Prerequisites: L.LIB-100, L.LIB-105, L.LIB-110, and one course from L.LIB-130, L.LIB-135, or L.LIB-220. 3 credits. This course embraces three themes central to the “Identity and Community” category. The themes include (1) person-to-person interaction with friends, family members, romantic partners, and co-workers; (2) how the roles of community, culture, and gender influence person-to-person interactions; and (3) how technology and media influence person-to-­person interactions. Prerequisites: L.LIB-100, L.LIB-105, L.LIB-110, and one course from L.LIB-130, L.LIB-135, or L.LIB-220. 3 credits. Creative video production in out-of-studio locations; includes concept development, audience analysis, cinematography, audio sweetening, lighting, digital editing. Includes the creation of commercials, dramatic and documentary production. Prerequisite: L.COM-158. 3 credits. Intercollegiate participation as an attorney or witness in a simulated court trial or in a mediated settlement conference; stresses analytical and presentational skills. In part, the student will be evaluated by professors, attorneys, and judges. Prior legal knowledge not essential. Consent of instructor required prior to enrollment spring semester. 1 credit per quarter. Can be repeated. Students will experience the world of animation while examining the impact and development of animation in relation to its emergence as a part of the entertainment and information industries. A major part of the course will consist of an in-depth experience with animation software and other techniques used to create animation. No prerequisites. 3 credits. January term. An examination of the selection, content, and delivery of print and broadcast news on the local and national levels. Students will engage a variety of news sources in order to analyze their methods of presentation and structure and in order to gain a greater understanding of the media’s role in determining what news is. L.COM-158 can be taken prior to L.COM­280 or concurrent with L.COM-158. 3 credits. An international survey focusing on films of cultural, historic, and artistic significance. The course utilizes film history and film theory to introduce students to the diversity of motion pictures as an art form and as a transmitter of culture. Prerequisites: L.LIB-100, L.LIB-105, L.LIB-110, and one course from L.LIB-130, L.LIB-135, or L.LIB-220. A survey of the historical progression of rock and roll from its pre-rock origins to the present. The course focuses on how rock music has given a voice and identity to various subcultures of the past 50 years, including hippies, punks, rappers, and Rastafarians. Prerequisites: L.LIB-100, L.LIB-105, L.LIB-110, and one course from L.LIB-130, L.LIB­135, or L.LIB-220. 3 credits. A creative, video production course in which students travel to international and/or domestic locations to produce a film. As a production unit, students will engage in all elements of the production process, including research, writing, cinematography, editing, and distribution. The location, genre, and film style of each production will vary each year. Indicative work includes documentary, ethnographic, and narrative filmmaking. This course can be repeated. Open to sophomores, juniors, and seniors subject to professor approval. 3 credits. January term. An overview of the communication management process with an emphasis on both theory and practical application. The student will study, analyze, and draw conclusions from topics such as: audience research, media programming, ownership, legal and regulatory issues as well as other internal and external influences affecting the communication manager. Prerequisite: L.COM-131. 3 credits. Hands-on experience at the campus TV station or radio station. Experiences may include on-air talent, reporting, producing, news writing, editing, and management. Can be taken up to three times. Media Studies majors are required to complete a COM 293 and COM 493 sequence. Prerequisite: L.COM-158. 1 credit. This course will consider the philosophies, lifestyles, cultural products and legacy of the 1960s counterculture commonly known as the “hippies.” In particular the course will examine how the hippies rejected the values of their parents’ generation and embodied opposing values. This will entail looking at the origins of the hippies in the Beat Generation of the 1950s and their bohemian lifestyle, the height of the hippie movement in the Summer of Love of 1967, the demise of their utopian idealism, and the longer-lasting legacy of the counterculture in a variety of significant cultural movements, including environmentalism, pacifism, feminism, and a generally greater societal openness. The course will explore these topics through lectures, readings, films, music, discussion, and a trip to San Francisco and Monterey to visit the center of the hippie movement, the Haight­-Ashbury District, and the location of the Monterey International Pop Festival. 3 credits. January term. This course is developed so as to allow students to explore the performance art of “live theatre.” Through work-shopping techniques such as improvisation, storytelling, and speed writing; students will write, rehearse and perform as original performance piece. Previous performance experience is recommended. Instructor permission is required. 3 credits. January term. Students will explore the world of children’s theatre by creating an original script for performance during the spring semester. Students will formulate a performance concept, analyze submitted pieces from local elementary schools, provide feedback on the submitted pieces through a rubric developed by the class, and create a performance script based on the chosen pieces. Students must be available to participate in the children’s production during the spring semester. Permission of the instructor is required. 3 credits. January term. An examination of the methodologies, trends, and practices of social media technology in journalistic mediums. Extensive work in application of those technologies for mobile journalists. Prerequisite: L.COM-131. 3 credits. This is an upper level, creative production course applying the concepts, techniques, and skills of motion graphics using Adobe After Effects. Through exercises and the process of creating their own unique work, students will develop an understanding of a variety of technical and conceptual methods when executing idea into form for both commercial and creative productions. Prerequisites: L.COM-158 or L.COM-164 or permission of instructor. 3 credits. A continuation of the basic public relations writing course that stresses working with media personnel and writing for Internet and media formats. Requires students to conduct situational analysis and to demonstrate a grasp of appropriate principles. Prerequisite: L.COM-202. 3 credits. Further development of skills introduced in the basic broadcast writing course, emphasizing longer and more complex formats, documentaries, corporate videos, and narrative programs. Elements to be included are knowledge of structure, flow, and appropriate presentation of content. Prerequisite: L.COM-225. 3 credits. Further study and practice in television production and theory for the advanced student; emphasis on how to manage and direct productions. Requires individual demonstrations in traditional and experimental styles and forms. Limited enrollment. Prerequisite: L.COM­257. 3 credits. This course provides an overview of some of the theories by which films have been critiqued over the years. These include auteur theory, genre theory, feminist theory, and postmodern theory. 3 credits. Course examines the origins and significance of the Blues and Rock & Roll by focusing on two of the most important musical artists of the 20th century: Robert Johnson and Elvis Presley. Includes travel to Memphis and the Mississippi Delta Region. The course will look at the historical, musical, and cultural contexts in which the music was created. 3 credits. January term. A survey and application of theories and premises derived from rhetorical theory as well as behavioral and communication studies; emphasis on uses of persuasion in media and public relations efforts. Prerequisites: L.LIB-110, L.COM-190 (may be enrolled concurrently). 3 credits. This course examines ways in which the arts, including literature, music, film, theater, and the visual arts, were used as forms of dissent and resistance in the 20th century. Representative topics include the life and literature of Franz Kafka, the creation and performance of art in the concentration camp at Terezin, the films of the Czech New Wave of the 1960s, the music of the Plastic People of the Universe, and the dissident writings of Vaclav Havel and others in the aftermath of the Soviet invasion of 1968 and how they contributed to the fall of Communism. Prerequisites: L.LIB-100, L.LIB-105, L.LIB-110, and one course from L.LIB-130, L.LIB-135, or L.LIB-220. 3 credits. A study and application of critical analyses of the media. Students will examine standards and theories applicable to the media, including aesthetic, social, regulatory, and production goals and strategies. Students will also study the media’s obligations to the public, as well as the economics and politics of media production in light of its operational structure. Students will be required to know and apply abstract concepts to media texts. Prerequisite: L.COM-131. 3 credits. An analysis of legal regulation of communication: First Amendment, defamation, privacy, media access, free press-fair trial and commercial speech. The student is expected to read, evaluate, research, write and articulate significance in selected judicial opinions. Substantial background in media, public relations, politics or history recommended. A minimum grade of C is required for students majoring in media studies. 3 credits. Credit will be allowed for off-campus cooperative education experiences consistent with the student’s background. Weekly reports, evaluation forms and conferences are required for credit to be received. Prerequisite: Substantial background in courses or experiences preparing the student for independent work in the area of the internship. Prior approval of the chairperson is required. Credit varies. An examination of various communication topics and/or issues. 3 credits. An advanced course requiring analysis and evaluation of historical and current public relations situations, particularly the impact on organizational structure and the decision-making process. Prerequisites: senior standing in the public relations major or minor or the consent of the instructor. 3 credits. The course examines the conceptual foundations of contemporary communication research, literature in the field of communication, processes and uses of quantitative and qualitative analysis, research methods in the discipline and the ethical issues of research. Students will produce an extensive research paper. A minimum grade of C is required for students majoring in Media Studies or Public Relations. Prerequisite: Senior standing in public relations or media studies or the consent of the instructor. 3 credits. The seminar is designed to prepare public relations students to seek and secure post­graduate employment. Students will be required to complete an electronic portfolio. Prerequisite: senior standing in public relations or the consent of the instructor. 3 credits. A seminar-style course requiring the student to prepare a major project or research paper for presentation in the spring semester. The course will explore a variety of advanced media topics. Prerequisite: Senior standing. 3 credits. Hands-on experience with The Lorian or MyDuhawk.com converged website. Journalism minors must take two semesters; one semester with The Lorian and one semester with MyDuhawk.com. Instructor approval required. 1 credit. Hands-on experience at the campus TV or radio station. Students are required to perform in a producing or management role at the station. Can be taken up to three (3) times. Prerequisite: L.COM-293. 1 credit. Independent Study course. See Division Chair for more information. Professor Schaefer specializes in creative video production and broadcast journalism. He is an award-winning documentary filmmaker and commercial director. He currently serves on the board of directors for the Iowa College Media Association and the Iowa Broadcast News Association. Dr. Kohl earned his Ph.D. from the University of Utah and specializes in Film Studies, Media Criticism, Media Writing and Popular Culture. He has been published in various popular-culture texts and journals, and is a member of the Popular Culture Association and the Midwest Popular Culture Association. Dr. Kohl has been teaching at Loras since 1995. Professor Mederson is a doctoral candidate at the University of Wisconsin-Madison in the School of Journalism and Mass Communication. He specializes in media production, journalism, digital storytelling and media history. Mark’s doctoral research focuses on U.S. media coverage of the sport of boxing, historically, with an emphasis on the presentation of African-Americans and the collective memory. He earned his M.A. in journalism and mass communication from Texas State University. His thesis examined the use of web cameras for prison visitation. He received his B.A. in telecommunications from the University of Kentucky. Mark worked in the television and film industry for more than 25 years before returning to school. He worked as a television sports reporter and anchor for several years and also produced a number of award-winning documentary films. Professor Meyers received his MFA from the San Francisco Art Institute in 2003. He specializes in experimental video, motion graphics, digital imaging and digital design. Meyers’ body of work ranges from single- and multi-channel video works, large-scale video installations, digital photography and short experimental films. His award-winning work has been exhibited and screened internationally, and has been recognized in national and international art publications.